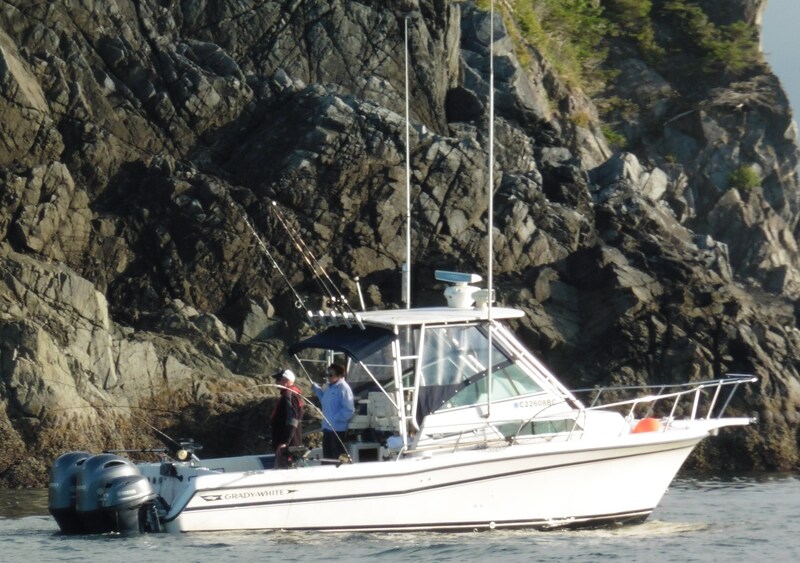 Barkley Sound – a Fisherman’s Paradise! 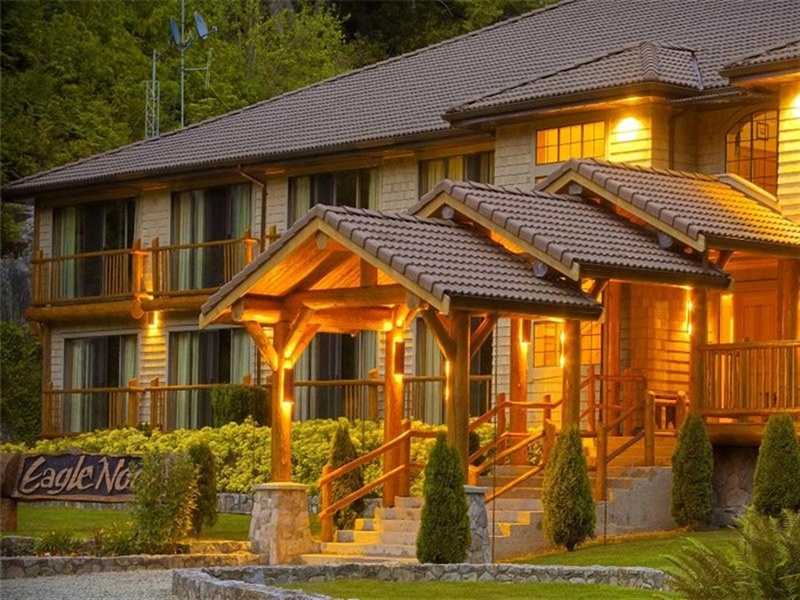 Earlier this month, my sons Patrick, Kevin, and I had the awesome opportunity to participate in the 2015 Salmon University trip to Eagle Nook Wilderness Resort and Spa on Vancouver Island. 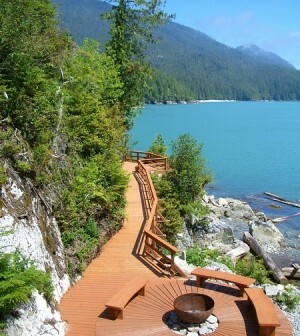 The resort is located in a sheltered cove in the northeast corner of beautiful Barkley Sound on Vancouver Island. 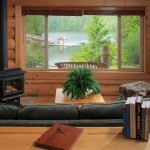 The Lodge is built on an isthmus, so all the rooms have a water view. 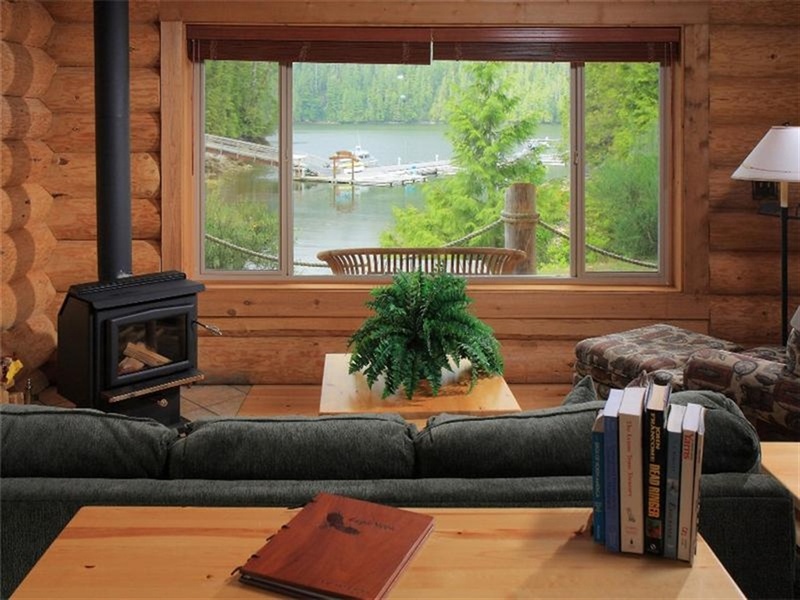 Plus, their moorage is very sheltered and secure. 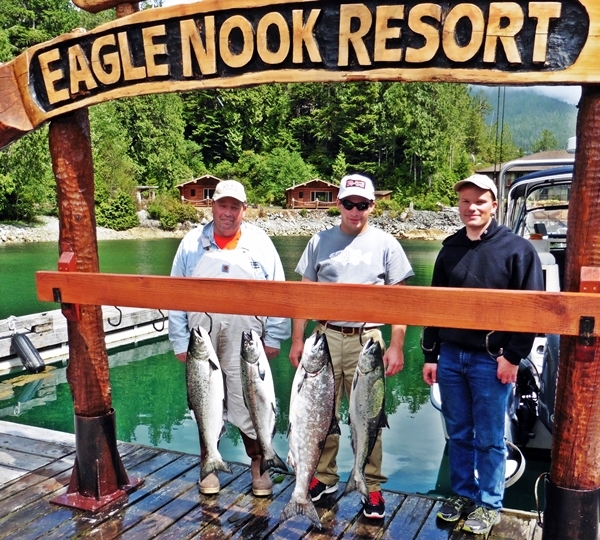 The Salmon University Trip offered anglers 3 ways to enjoy this adventure. 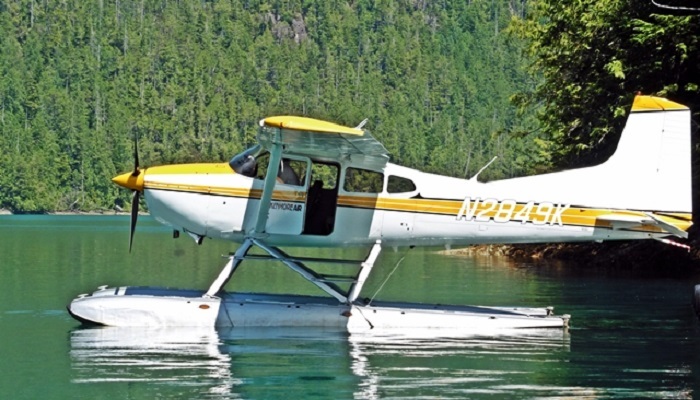 You can fly by floatplane into the resort, drive to Ucluelet and the resort’s water taxi will pick you up and transport you to the resort, or go in by your own personal boat. While I have never flown into the Resort, I cannot think of a more scenic trip than travelling there via a small plane over this gorgeous area. With either of the first two options, you will be fishing with resort guides from Lucky Sportfishing. All of Lucky’s captains are experts fishing this area. Their boats are Grady Whites which makes for a pleasant ride. 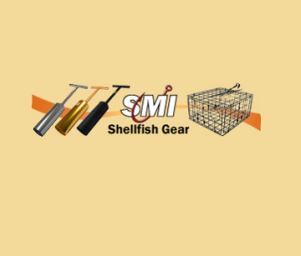 All their fishing gear is top of the line. The third option to enjoy this adventure is to “boat in” with your own boat. That is what we did. I must say it was an extremely special trip for the Gavins. 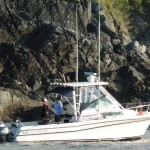 I had been fishing Barkley Sound with my sons for many years until they both went away to college. Both are now WSU graduates: Patrick (class of 2015) and Kevin (class of 2016). This was our first trip back there together since before they started college. It turned out to be awesome! The Gavins with some of their kings! For those that are not familiar with getting to Barkley Sound, I will tell you how we got there. Drive north on I-5, and continue north, getting off at exit 276 (the Blaine “Truck Crossing”) where you clear Customs. You continue north on Highway 99 (formerly I-5 in the U.S.) and take the exit for the Tsawwassen, B.C. Ferry terminal. The B.C. ferry will take you to Duke Point which services Nanaimo on Vancouver Island. (I strongly recommend making ferry reservations.) The crossing is about two-and-a-half hours and is very scenic. 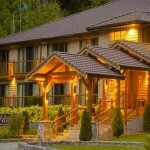 Once on Vancouver Island, you drive to Port Alberni. There are hotels there if you want to spend the night, a secure storage lot and a good boat launch with parking at Clutesi Haven Marina. However, we drove about 20 miles further and stayed at China Creek Marina and Campground. In all, our total road mileage was about 220 miles. However, I must caution that the road to China Creek is a logging road and was very rough this year. So, staying in Port Alberni proper would have been a better choice. On Sunday morning, we launched the boat and took a very scenic 60 minute ride to the Eagle Nook Resort. By running to the resort in the morning, you experience the calmest water of the day. We were able to cruise very comfortably the entire way at between 35 and 40 MPH. You also can stop and fish along the way, but because we were excited to get to the resort, we decided not to do that. 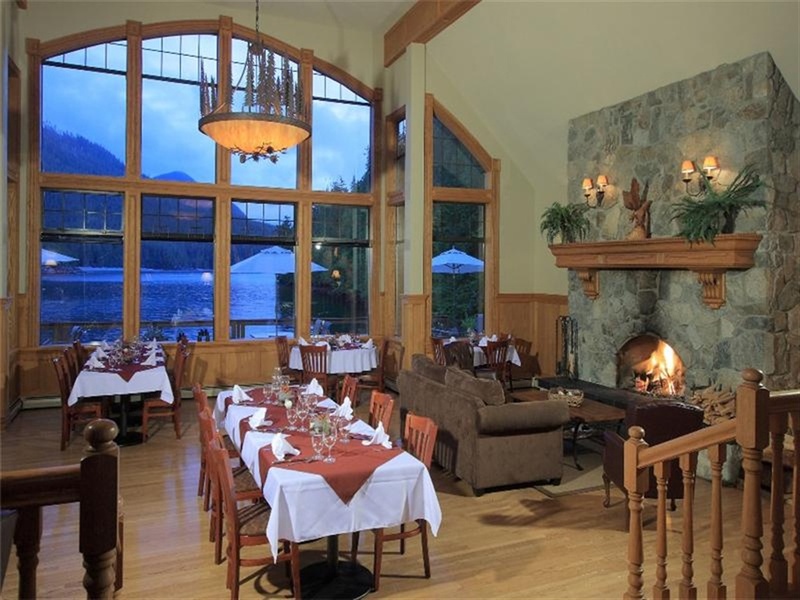 Once we were checked into our rooms, Dan Brunet, who is both the resort manager and manger of Lucky Sportfishing, gave us a detailed tutorial on places to fish for both salmon and halibut, aalso where to prawn. He also encouraged us to talk with the charter captains to get more information on gear, and also to follow them out to fish nearby during our stay. That is what we did most days. 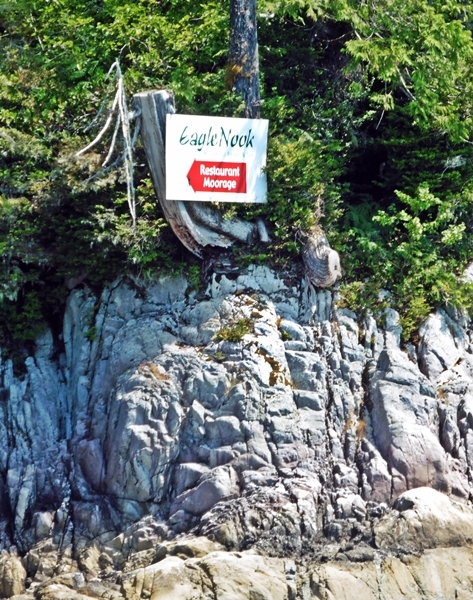 The resort is in a very sheltered and secluded inlet, so they have this sign to help boaters find it! After that, we went out for evening fishing and to drop our prawn pots. We had no problem dropping our pots but the afternoon winds had come up with a vengeance, so we decided to head back to the Lodge for an early dinner and to enjoy some of the amenities at the resort. 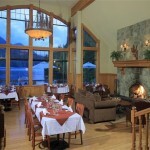 The resort is truly “4 Stars” as noted in all the travel guides and has an abundance of features and services. My sons opted to use a couple of the resorts kayaks for several hours that evening. Later in the trip they tried the stand-up paddle boards and also enjoyed some of the hiking trails around thelodge. The outdoor hot tub was very popular with some of the guests. Some of the wives on the trip also used the masseuse and spa services that also available there. Then, of course, there was dinner! It started with an hour of appetizers specially prepared by the resort’s chef. Then there was a three-course meal that was served at a leisurely pace in a gorgeous high ceiling dining room with a great view of the water. Each guest gets to customize their nightly meal with a choice of four to six options for each course. We tried a large selection of these options during our three nights and it seemed each one was more delicious then the last! The nightly highlight was a campfire under the stars where guests and guides alike gathered to swap fish stories and enjoy a few adult beverages. When you were finely ready to retire for the evening, you get to sleep on the most comfortable bed that I have ever experienced in my life. Plus, each room has its own private bathroom complete with a tub and shower. But, getting back to the main purpose of the trip: fishing. On Monday (our first morning at the resort), the majority of the guides were taking their clients off-shore. Ocean conditions were pretty rough that morning, so several of us with our own boats decided to run over and fish the famed wall at Bamfield. 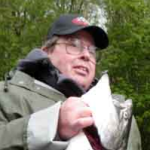 It was a location that I had fished many times in the past and, if there were fish, I knew we could get them. And get them we did! We caught a large number of legal (but small) and sub-legal Kings plus lots of Pinks. After awhile we got tired of this and ran out to Kirby Point. But the tide had already started to change and the bite was just ending as we got there. So we decided to head back to the resort and pull our pots on the way. We got a couple dozen huge spot prawns from each of our traps and headed in to relax at the resort and enjoy some of the many amenities and fabulous dinner! On Tuesday, ocean conditions were worse. This rough water is very unusual for this time of year. Normally, it is calm and fog tends to be the only problem. So, we decided to follow several of the guides out to Effingham Island. This is because one of the guides fished there on Monday and had good success. We rode in the wake of one of the guide boats for the short, 25 minute ride to Effingham Island. The trip skirts the Broken Island Group and the scenery was unbelievably gorgeous in the early morning light. It was a great choice because no sooner did I have the first rod down, we had a nice 12-pound King on! These fish are actively feeding and are extremely strong. It made several very long runs before we were able to subdue it. This started a trend for us. We were able to land 3 more keeper Kings during the next several hours. Plus, we lost several more due to their very aggressive fighting ability. Additionally, we only caught a few small Kings and Pinks, so fishing was a lot more enjoyable. Our Killer Combo: Pro-Troll and Gold Star the Winning Team! While the smaller Kings and Pinks would hit almost anything, the larger Kings were fussier and it took us a while to figure out the pattern. Our repeated successes came at depths of 120 and 140 feet off the downriggers. 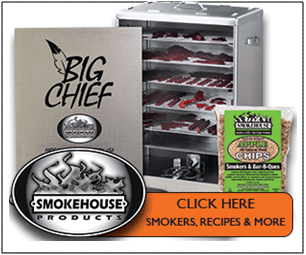 We used two new Pro-Troll 11-inch Hot Chip flashers. 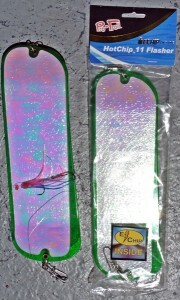 They were the Moonbeam on a Clear UV blade with a Glow back and Moonbeam on a Green blade with a Glow back. Both flashers also have a red stripe on the front side (model numbers are HC 11-770 and 772, respectively). We fished a Gold Star 5-inch Glow Yellow Tail “Jambo Style” King Fisher spoon on a 47 inch leader behind the Pro-Troll flashers. The speed did not have to be precise but we tried to keep it between 2.0 to 2.5 MPH (GPS). Similar to the day before at Kirby, when the tide ended the bite stopped. So we ran back to the resort stopping to pull our pots along way. Once there, the boys enjoyed the daily dockside clam chowder the chef brings down, while I filleted our fish. The resort has excellent cleaning tables. And once the fish are filleted, you turn them over to the resort staff, who vacuum pack and then flash freeze them. That leaves you more time to enjoy the resort’s many features and services. Or as I did, just sit back and enjoy the wonderful view until it was time for the nightly appetizers! 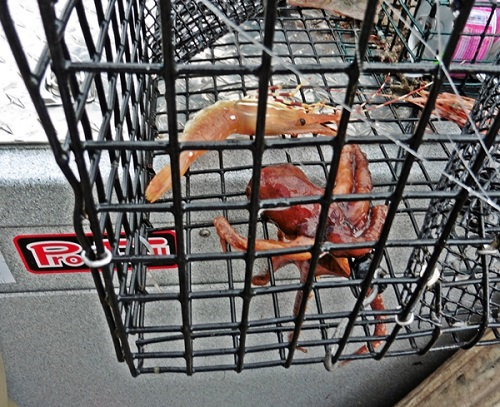 Octopus in the prawn trap! On Wednesday, we fished at Effingham Island again. We got one king that we kept, and released several smaller ones. We headed back to the Resort and checked out at 2:00 pm. Then, we went out and pulled our pots for the final time. We got a real surprise! One of the pots only had a few prawns in it but also contained an octopus. When we released it, the octopus left a series of inky black clouds just like you see on the nature shows on TV. That was very special as it had never happened before. The water in the Alberni Inlet was pretty whipped up by the afternoon wind but as we were going with the wind, it still was a pretty smooth ride. When we got to Underwood Cove near China Creek, we stopped and fished for sockeye. In the next couple of hours, we hooked over 50 sockeye but only landed 11. There were so many sockeye in the water, that we had to adjust our sonar unit because it kept thinking the fish were the bottom. 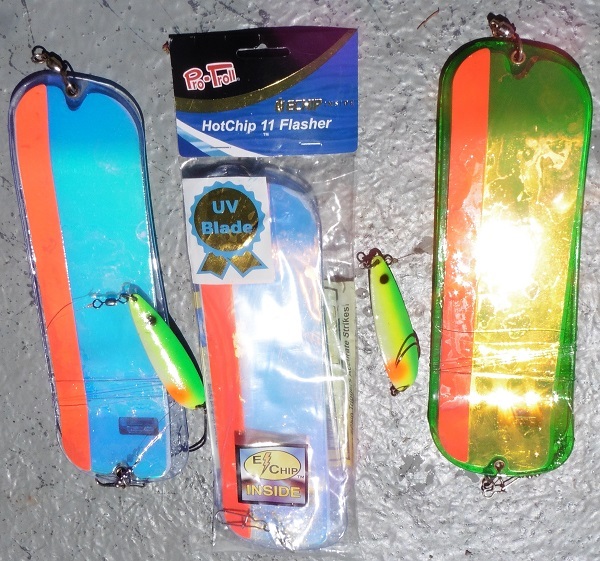 Our success is pretty easy to duplicate: We used Pro-Troll -11 inch Hot Chip flashers in the Glow Green pattern (model number HC 11G-185) and a blue and pick hoochie on a 18 inch leader. We set that back 12 feet behind the downrigger cable. 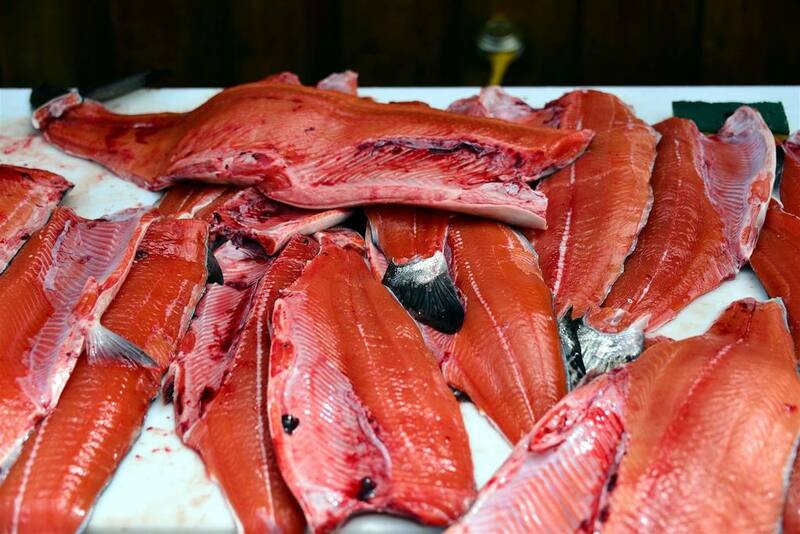 Have you ever seen so many Sockeye? Below our release, we ran three Pro-Troll SpinRay 10-inch flashers also in the Glow Green pattern (model number SR10-105). 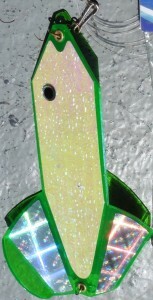 These “Dummy Flashers” are used to create “your own school of fish” below your offerings. 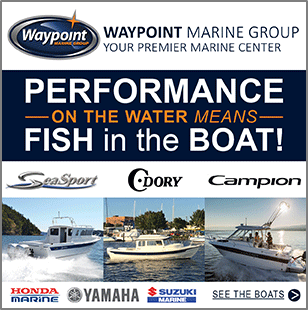 You put them on your downrigger cable with halibut clips and 5-foot leaders of 110 pound mono. You space them 7 feet apart so that they will not tangle. The SpinRays-10 are an in-line flasher and have less than 10% of the drag of a rotating flasher. This makes them ideal to be used as “Dummy Flashers,” because they have low drag but still produce a lot of flash and noise in the water. Our most productive trolling speed was 1.7 MPH (GPS). 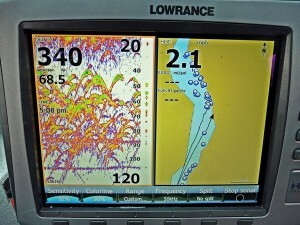 Our best depth was 88 feet off the downrigger cable. Note, I often stack two rods on one downrigger but with so many bites, it was pointless to attempt that. Before we left China Creek on Thursday, we went out for a couple of more hours and picked up enough Sockeye to limit out for our trip! These fish ranged from 4 to 8 pounds and are absolutely delicious! 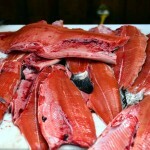 Also, they are in much better physical condition than sockeye that have entered fresh water. That explains why they fight so well and taste so good! 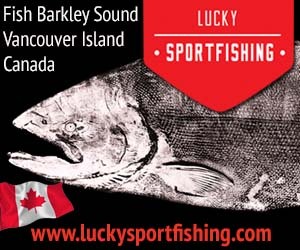 If you are interested in having your own adventure in Barkley Sound, contact Dan Brunet at dan@luckysportfishing.com or you can call him at 1-885 266-3347.